I started spinning poi almost 3 years ago. I caught it right away and quickly sewed up a pair of practice poi. A year into my poi fascination, I attended a Solstice Celebration in Southern Ohio. 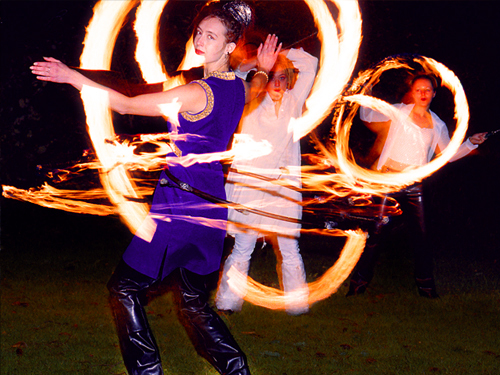 They had people that spun and twirled things that were on fire. I knew I had to spin fire poi. Well, it’s almost here. My fire poi are being shipped from New Zealand right now. I should have them in about a week. I’d like to be able to complete some of these tricks…soon. One thing I never really “picked up”??? Hoop. Yes, hula hoop. I’m taking a Hula Hoop Dance class right now. I still don’t quite have the hips right and I drop the hoop more than I spin it. But it’s fun and I’m learning. To hoop. I’m learning to hoop. Finally……. Hopefully fire hoop is next. This entry was posted in Shenanigans. Bookmark the permalink.